Cooper Union has a plan to go tuition free again (photo credit: David Shankbone). For many years, Cooper Union for the Advancement of Science and Art, offered all of its students full-tuition scholarships. With alumni that include Nobel Prize winners, Guggenheim Fellows, Pritzker Prize winners, Fulbright Scholars, and more, you could say that Cooper Union’s free college education was a real, one-of-a-kind treasure in American higher education. But beginning in the fall of 2014, the highly selective school (the admission rate is often below 10%) no longer covered the full tuition of admitted students. We reported as early as 2011 the school’s financial struggles which ultimately led them to have to start charging tuition. In spite of attempts by the Committee to Save Cooper Union to reverse this decision to instate tuition costs, the school had no choice but to begin charging tuition in order to remain financially solvent. But the work of the Committee to Save Cooper Union was not without success. 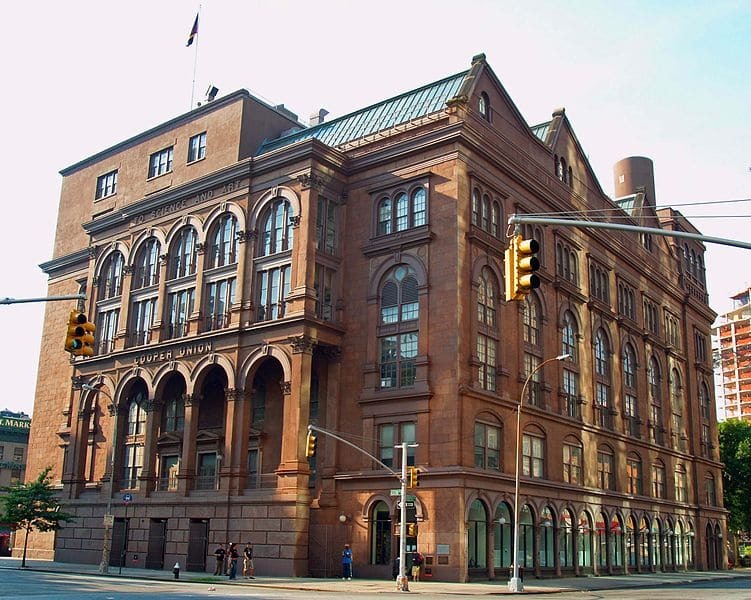 The group sued Cooper Union’s administration and in 2015 announced in a joint statement with the school the decision of Cooper Union to return, in short order, to a tuition-free policy. Earlier this year, Cooper Union’s Board of Trustees announced that all undergraduates would receive full-tuition scholarships again beginning in the fall of 2028. As reports David W. Chen in a piece for “The New York Times” entitled “Cooper Union Announces Plan to Reinstate Free Tuition,” “After adopting a bitterly contested plan a few years ago to charge students tuition for the first time in a century, the Cooper Union for the Advancement of Science and Art announced Thursday that it hoped to make the college tuition-free again for all undergraduates in 10 years. Under a plan approved by the board of trustees late Wednesday, Cooper Union would begin increasing tuition scholarships in two years, and aim to provide full tuition in 10. The additional outlay would be offset by unspecified cuts in expenses, more fund-raising and ‘other revenue increases necessary,’ the college said in a statement. It can’t be easy for an institution to not charge tuition. Cooper Union opened its doors in 1859. For a century — yes, a century — no students paid any tuition (there were some students who did pay tuition early on in the school’s history). So when Cooper Union announced that it would no longer be able to cover the full cost of tuition for its admitted students, we understood. A school that covers the full cost of educating its students for over a century should receive no criticism when it needs to start charging students in order to sustain itself. Cooper Union, you are a class act. Every institution of higher learning throughout this country would be wise to study all the things you do in all the ways you do them. In fact, let’s repeat for our readers what Cooper Union was able to achieve: they didn’t charge their students for over a hundred years. A hundred years! Cooper Union, we salute you for all of the work that you have done throughout your history to sustain a free-tuition college education — and for all the work you’re doing to restart the free-tuition program beginning in the fall of 2028. It’s truly remarkable. What do our readers think of the free tuition at Cooper Union? Let us know your thoughts and questions by posting a Comment below. We look forward to hearing from you!